Growing up, Christmas Eve night was characterised by the sound of sticky tape being rapidly pulled off the roll, as my Mum wrapped presents for us six kids late into the night. 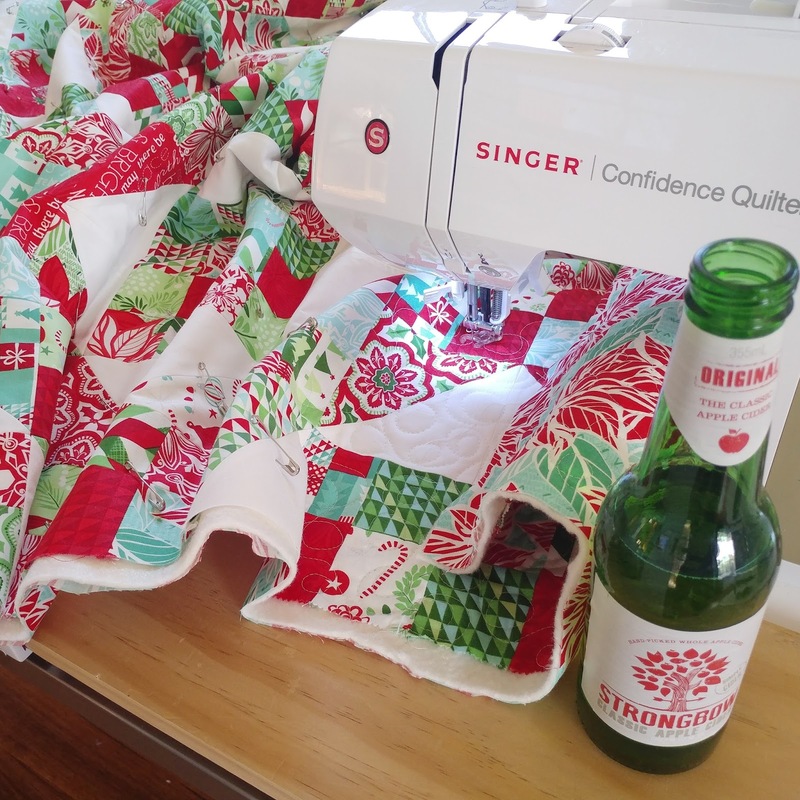 For the second Christmas Eve in a row, our house is filled with the sounds of me frantically finishing a Christmas quilt. 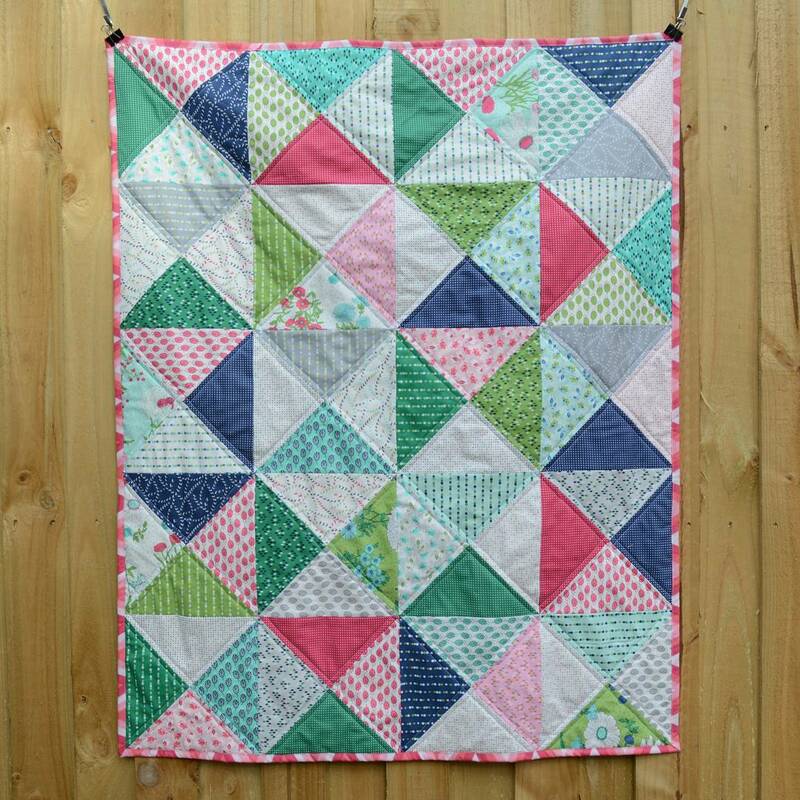 For this quilt I used a layer cake of Kate Spain's Jingle collection to make a bunch of Jacob's Ladder blocks. I'm not usually a fan of the traditional red and green colour palette but I quite like this collection. I had originally intended to place the Jacob's Ladder blocks in the usual lattice layout and make it slightly wider with a scrappy border, but my husband suggested inserting a few extra rows in the middle to make a new design. I love how it turned out. 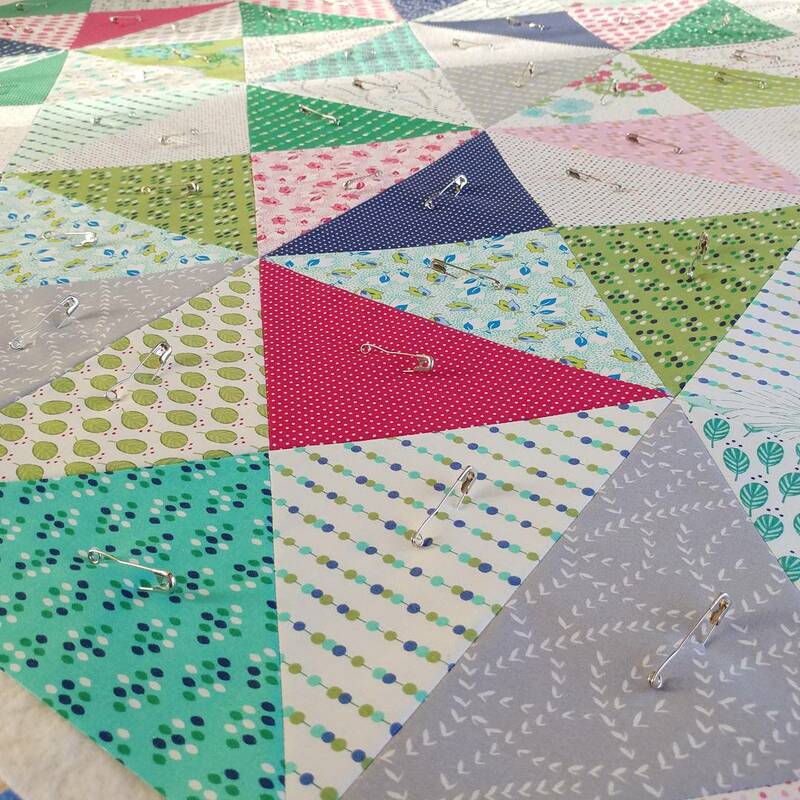 I ended up finishing the quilt on Christmas Day. It made a great couch quilt for our traditional Boxing Day movie marathon (this year we re-watched the Lord of the Rings trilogy). I'm linking up with Elm Street Quilts December One Monthly Goal and the 2017 quarter 4 finish-along as finishing this quilt was my goal for this month and one of my proposed quarter 4 finishes (#33 on my list). Hopefully next year I'll be a bit more timely with the completion of a Christmas quilt. I'm linking up with the 2017 Elm Street Quilts Bag It sew along for the last time and sharing some quilted stockings I made for a friend and her family. 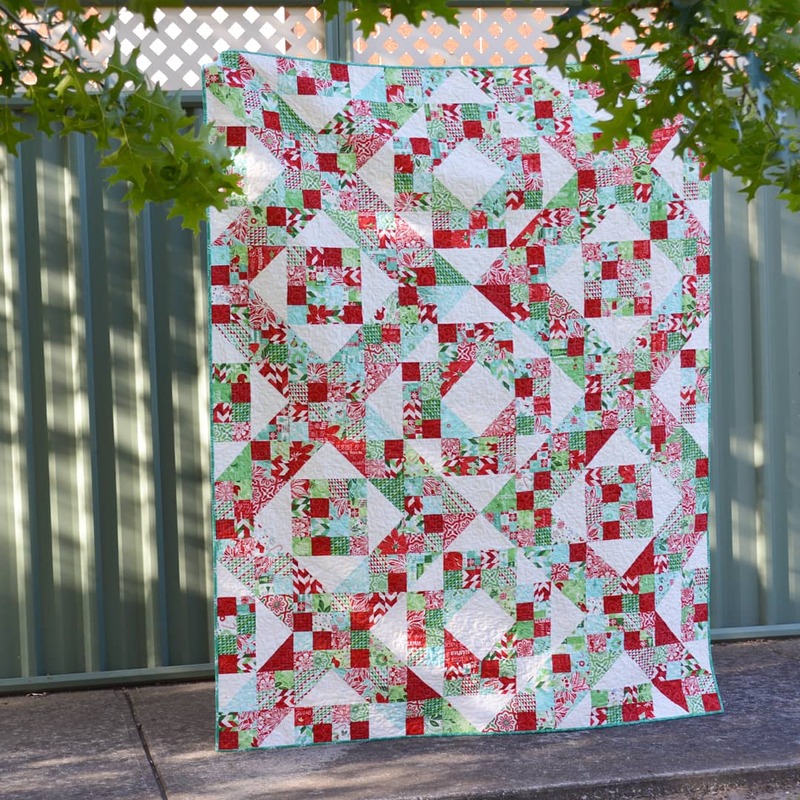 For these I some Cotton and Steel Christmas prints combined with some plain quilting calico. I love the rustic look that the calico gives. 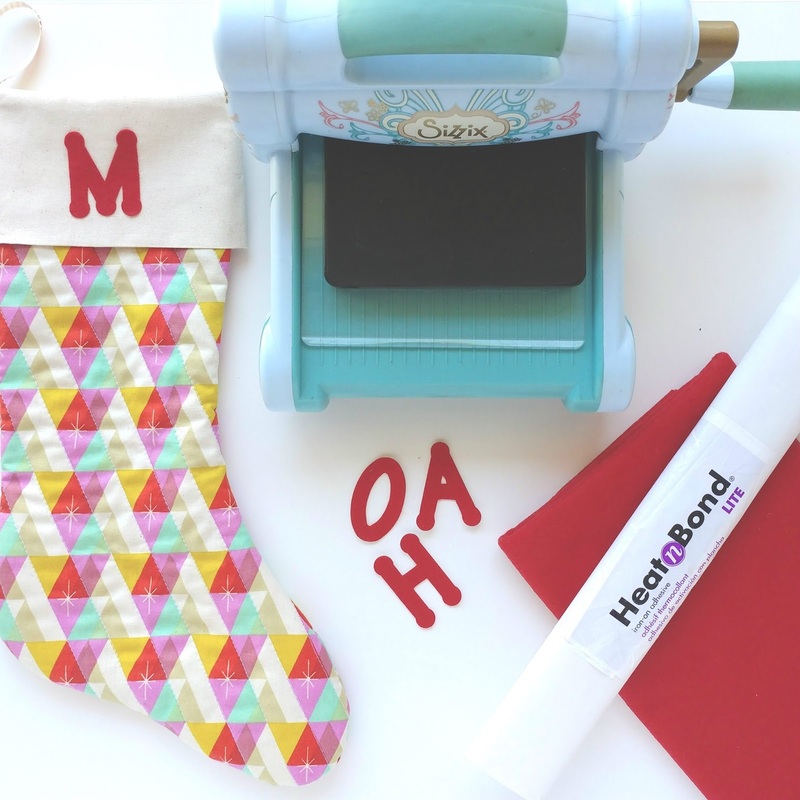 I also used some felt, heat-n-bond lite and a Sizzix die to make some DIY iron-on felt letters. I think this weekend's project will be to make some stockings for my own family. Luckily there is still over a week to go! I love to make bags for birthday gifts. Bags can be practical and pretty, which is my favourite combination for handmade items. 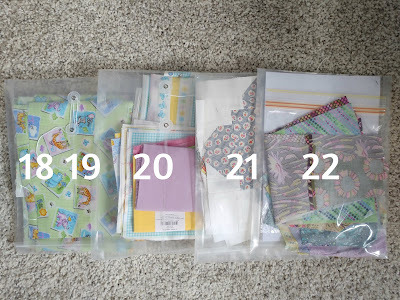 Bags are also fast to make, which is great for last-minute crafters like myself, who tend to leave birthday crafting until a few days before the deadline. Even more so when the birthdays fall in December, the busiest time of the year. 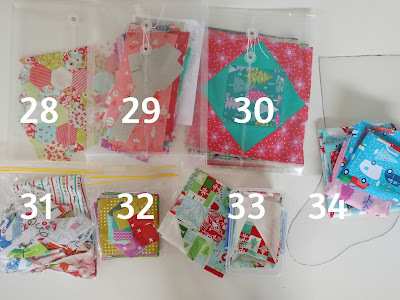 I thought I'd link up with Elm Street Quilts 2017 Bag It sew along and share some bags that I've made for December birthdays. 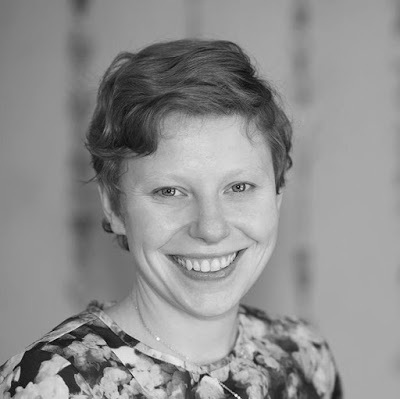 First up is my Mum, who celebrates her birthday in a few days. 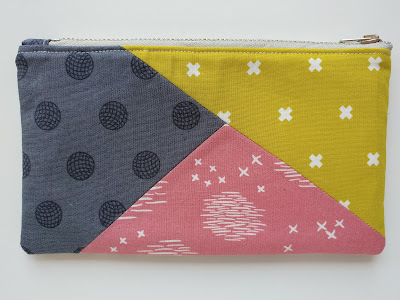 I made my mum a Zip Up Tray Pouch (pattern by Aneela Hoey), after she admired the one I made for myself. I used a single print for this one; a pretty floral pattern that I think she'll like. Next up is my friend Maree, who celebrates her birthday a few days after Christmas. 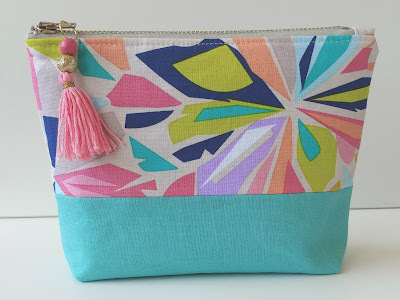 I made Maree a pretty zipper pouch (pattern by Sotak Handmade) using various scraps, including some turquoise linen leftover from making a bento bag for another friend also named Maree. I also made a bag for myself, since my birthday falls on the second last day of the year. 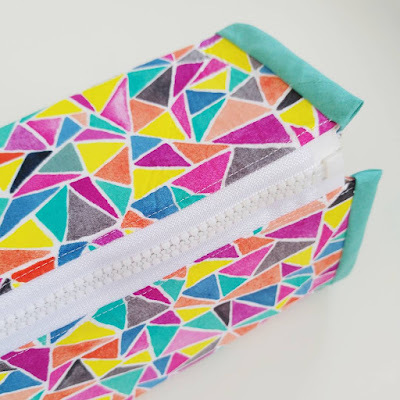 I used the scraps from making my December bee blocks to make a colour block pouch (a tutorial by Sotak Handmade). I'm hoping that next year I'll up my bag-making game and have a go at using hardware other than zippers. I've got a lot of bag and wallet patterns ready to go - I just need to find the courage to give it a go. 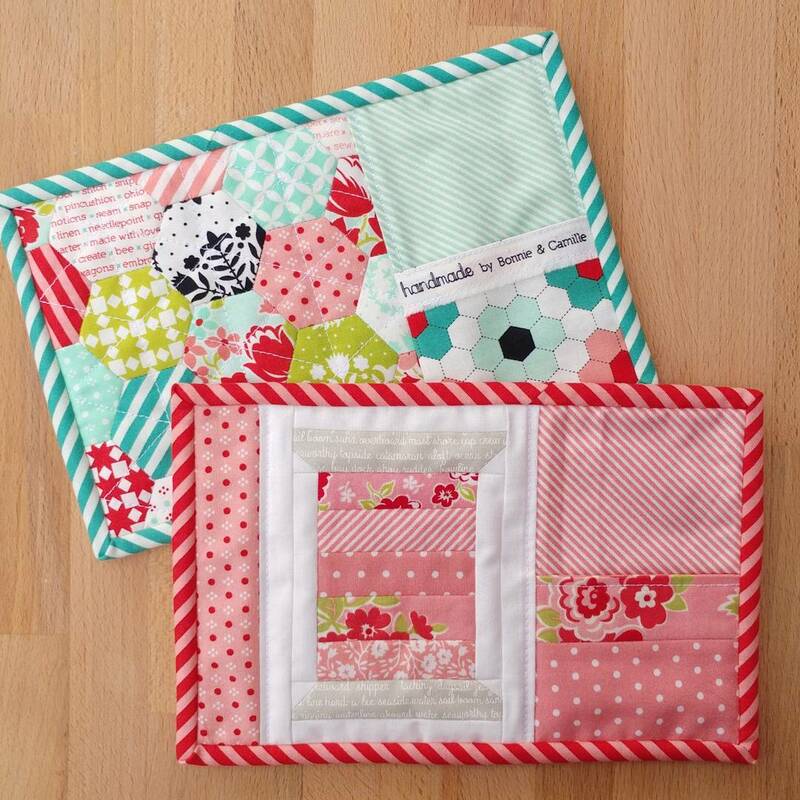 Just a quick post to share the blocks I made for our December Queen for the Beehive Quilts bee. 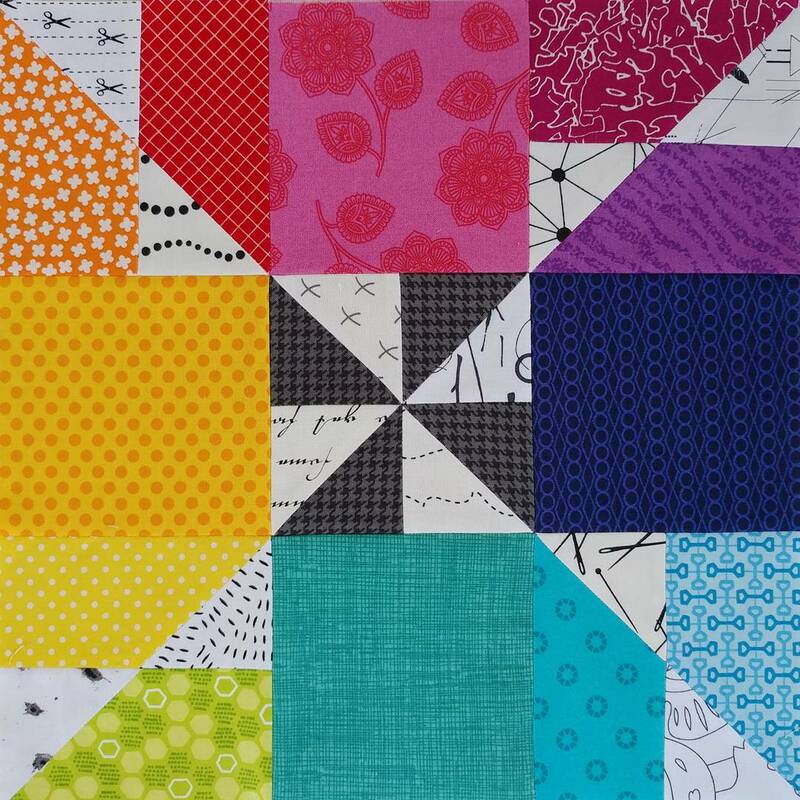 Bec requested the Fizzy block in low volumes, black, dark grey, dusty pink and mustard. The dusty pink was a little hard to find, but a rainbow F8 bundle from Pink Castle Fabrics saved the day. 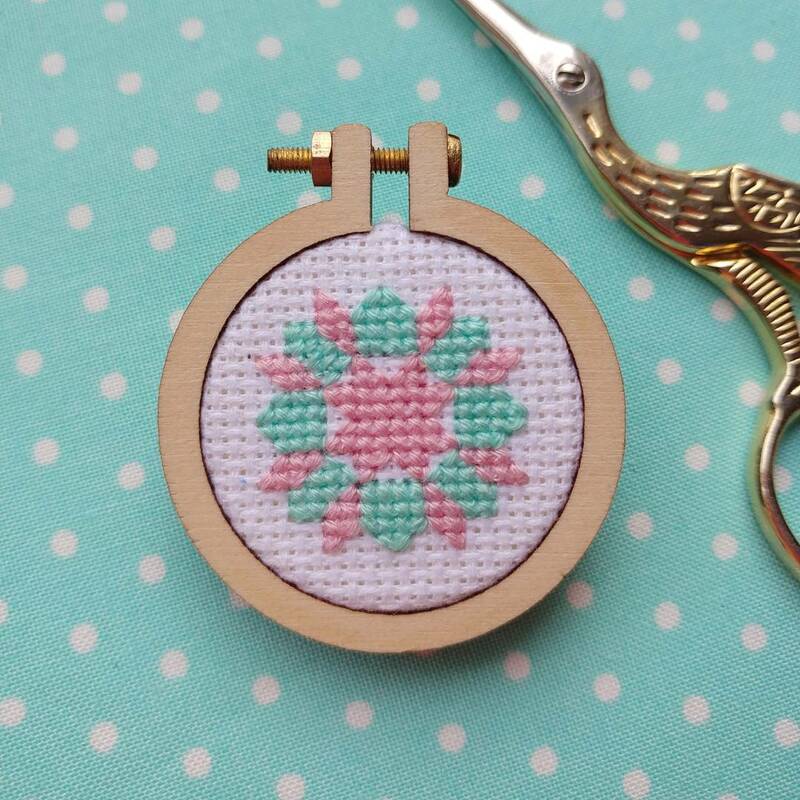 I'm a little bit in love with this colour palette and think I might replicate it in a quilt for myself. One of my favourite times of the week is Saturday night. Mr. Gray often takes the Graylets to Granny's house for a couple of hours so I can have some deciated crafting time. 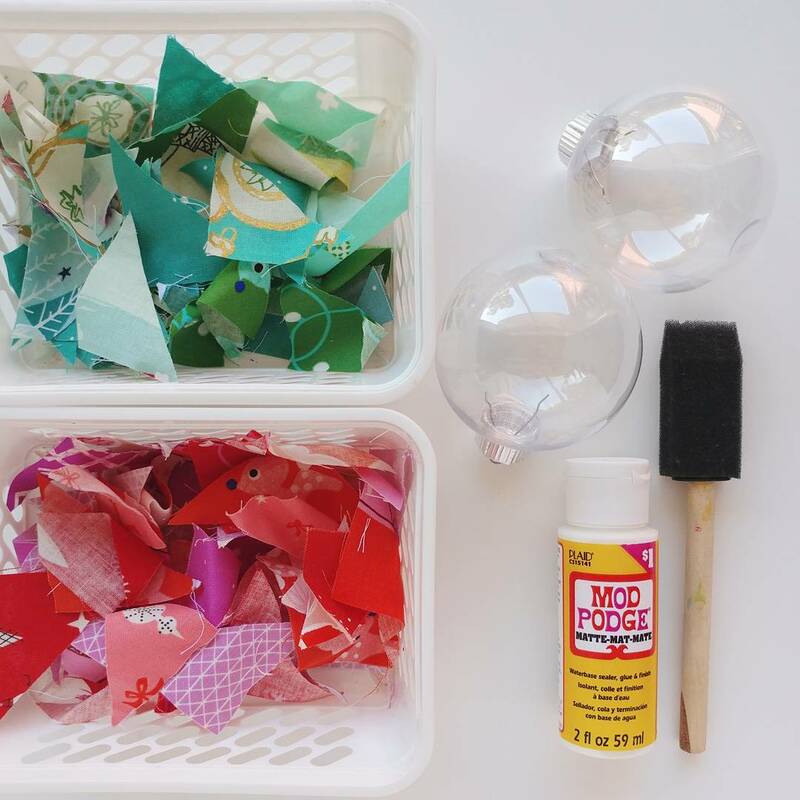 I also love Saturday nights because of #saturdaynightcraftalong - a weekly instagram party where crafters around the world share what they are working on. I love being part of this community, so when the oppourtunity came up to participate in the Saturday night craft along swap, I couldn't resist. My partner, Karen, posted this mosaic, highligting her love for pink and aqua, polka dots and geometircs, florals and scraps. 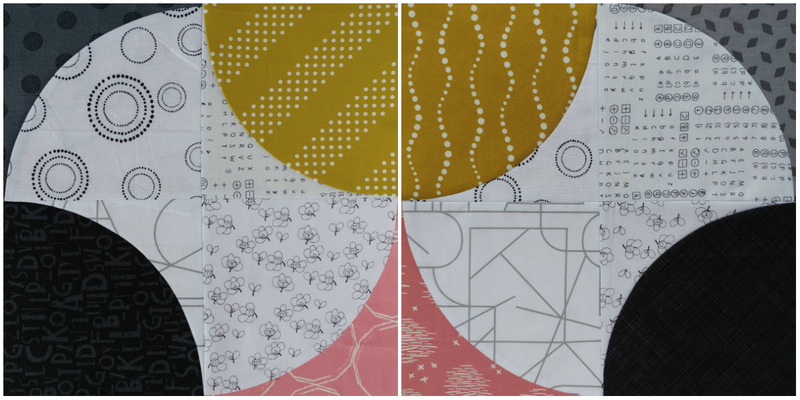 After some stash diving I can up with a fabric pull that fit the bill - some FQs from the Brush Strokes collection by Holly Degroot for Cloud 9 Fabrics. 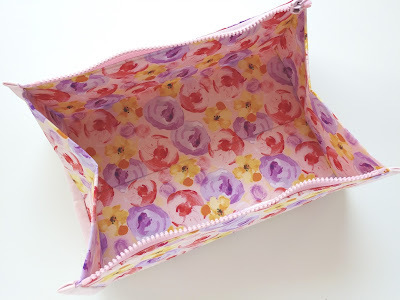 For the main item I chose to make a zip up tray pouch (pattern by Aneela Hoey). I love the one that I made myself a couple of months ago (it's so handy) and thought that my partner would appreciate one too. I used the triangle print for the outer, the light geometric print for the lining and the aqua print for the binding. I love how it turned out. 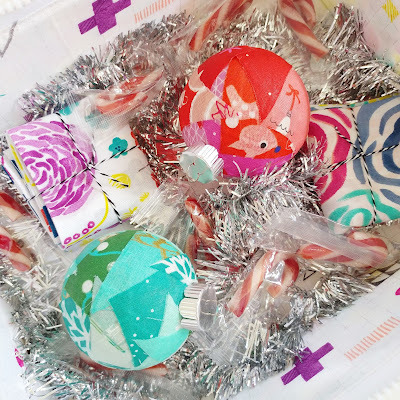 I also make a pair of scrappy fabric covered baubles using some scraps from last year's Christmas quilt and Mod Podge. The finished baubles were added to the pouch, along with the floral FQs and some candy canes before being sent off to my partner. I really enjoyed this swap, probably because my partner and I have very similar tastes - I also love pink and aqua, geometrics and polka dots. 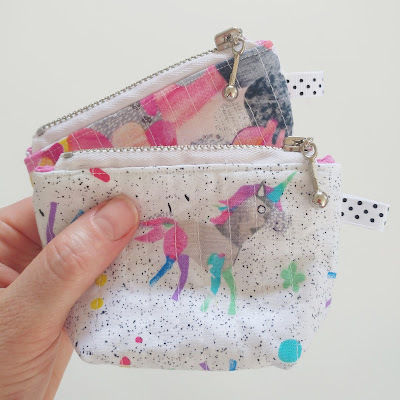 For proof, check out the little zipper pouches I made myself a couple of months ago (using this tutorial by Sotak Handmade). I only realized after the swap that I could have used these prints instead. 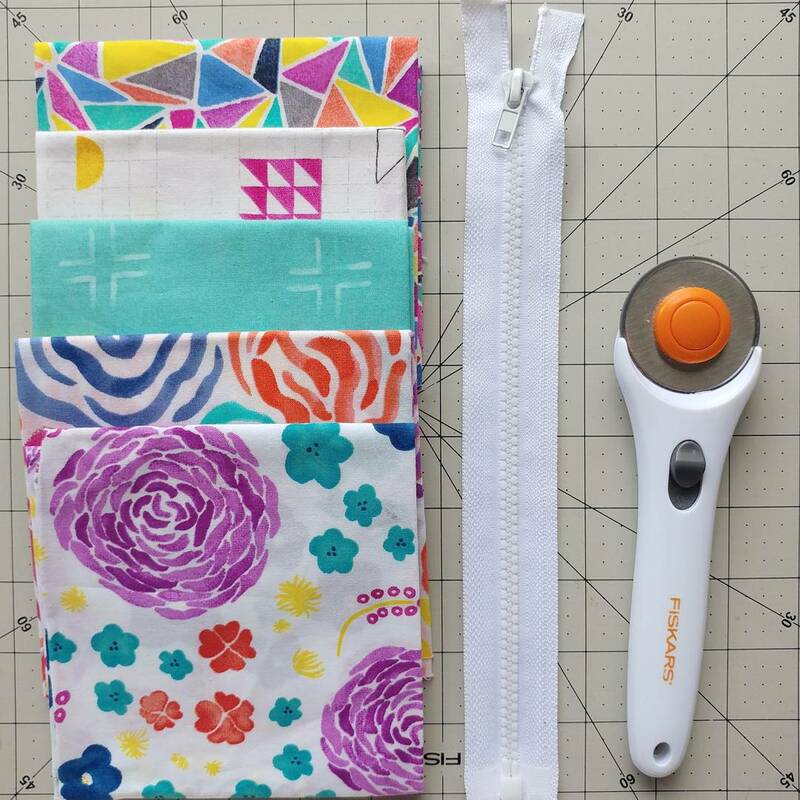 I'm linking these three pouches up with Elm Street Quilts 2017 Bag It sew along, as they were all completed during the event. It's a bit hard to believe that we are almost at the end of the year. 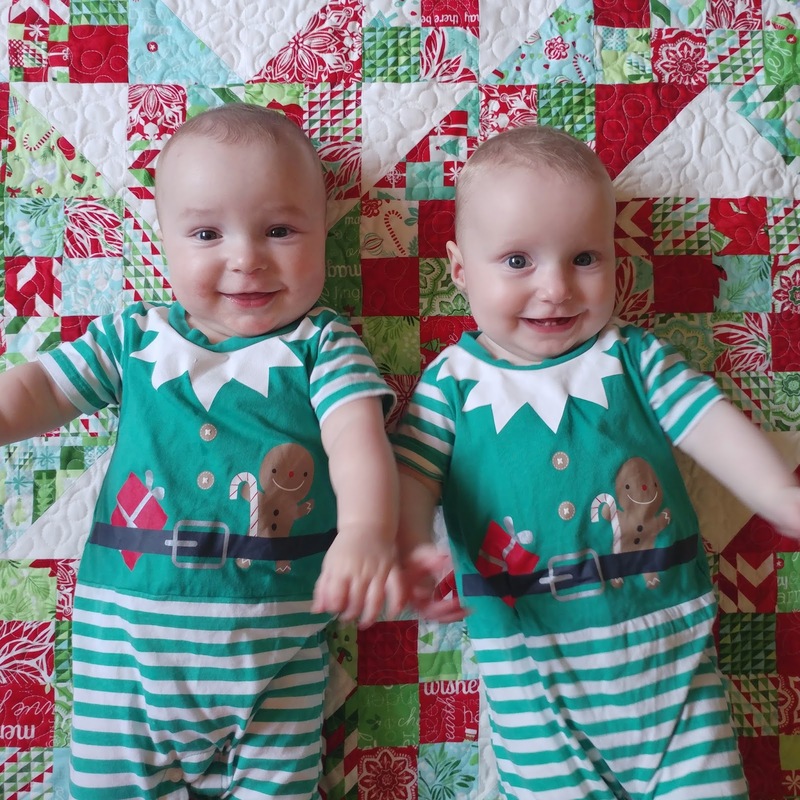 December is my favourite time of the year. December means more time with family, and lots of cause to celebrate (it's my birthday month). It's also usually the month that I start my Christmas sewing. As a result of leaving it this late, I often don't finish my Christmas sewing and have a few unfinished projects that carry over to the next year. This year I'm going to try to not start any new projects and instead complete some of the projects I started last year. I'm linking up with Elm Street Quilts December One Monthly Goal and setting myself a goal of completing a quilt I started last Christmas but didn't finish. Mostly because of big cutting boo boo, but also because I wasn't in love with my test block. 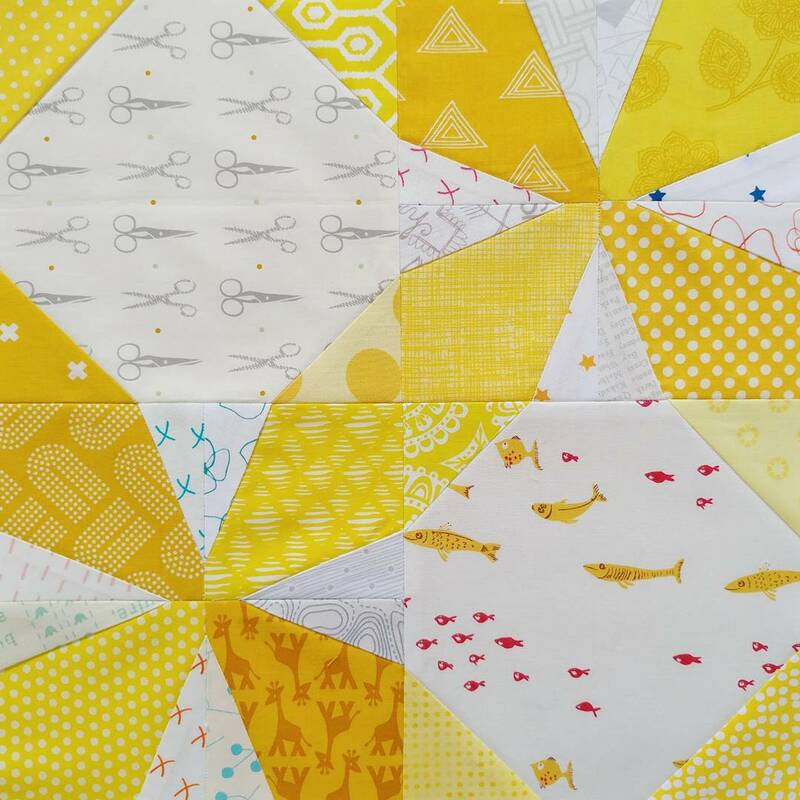 However, I adore this line (Jingle by Kate Spain) and want to try a Jacobs Ladder quilt, so I'm going to persevere. Hopefully some more careful fabric placement (rather than my usual random grab-n-sew approach) and replacing the white on white print will give a better result. Just a quick post to share the blocks that I made our November queen, Mandy. Mandy requested the tic tac toe block in magenta, bright orange and chartreuse. This is going to be one vibrant quilt! 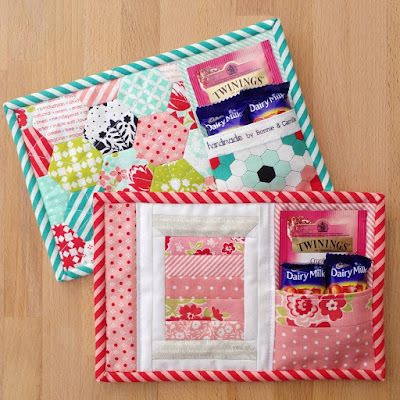 I'm also linking up with the Elm Street Quilts OMG link up as getting these done by the end of the month was my goal for November. I'm now officially up to date with my bee blocks! 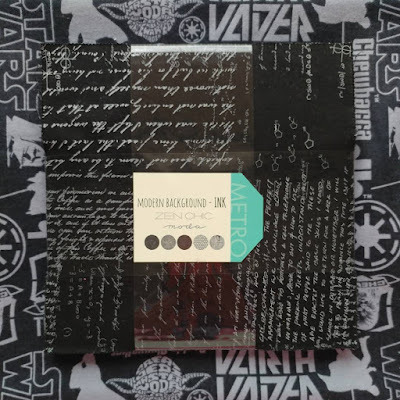 I wanted to keep it very masculine so I used a layer cake of Modern Background Ink and paired it with a Star Wars flannel for the back. To make the top I cut some of the layer cake squares in half diagonally, made HSTs amd trimmed to 9.5" square. I trimmed the remaining squares to 9.5" and arranged them semi-randomly, trying to create a sort of ombre effect. 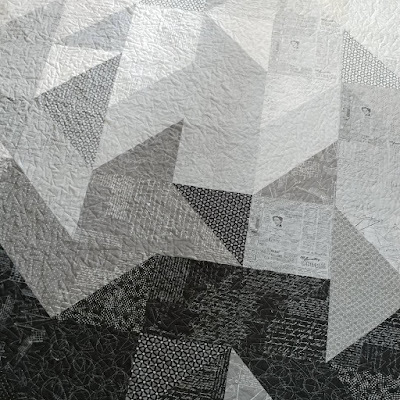 For the quilting I used a simple sharp stipple design (my current go-to FMQ all-over). 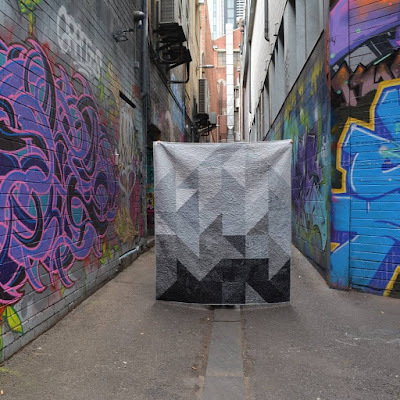 I took the finished quilt into the city for a quick photoshoot in Croft Alley. 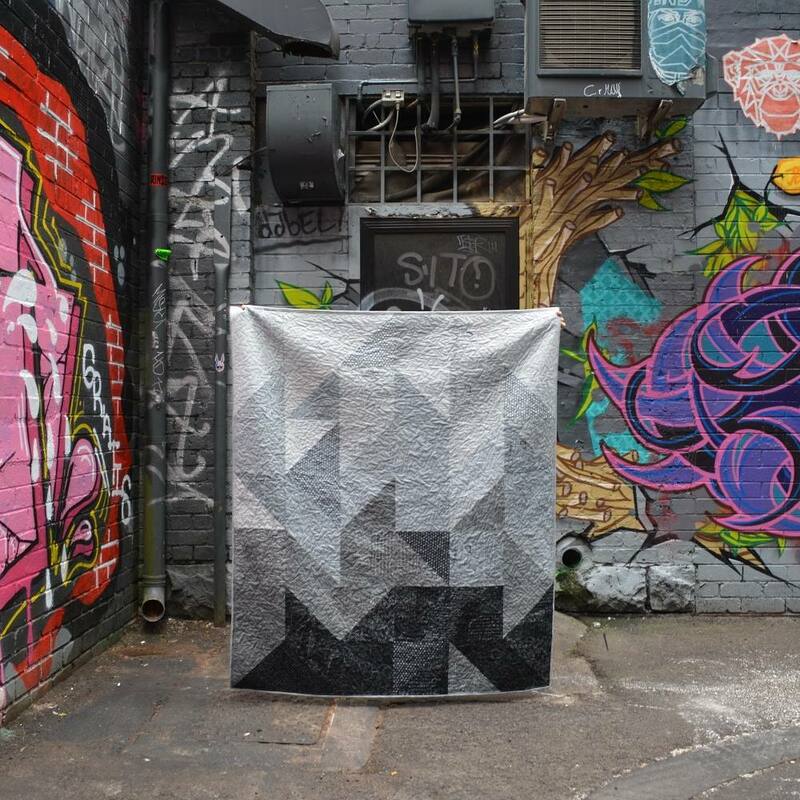 I thought the street art made the perfect backdrop for the graphic quilt. I'm really happy with how it turned out, and how efficient it was - both in terms of time (it came together really quickly) and fabric use (I used all of the layer cake squares with very little wastage). 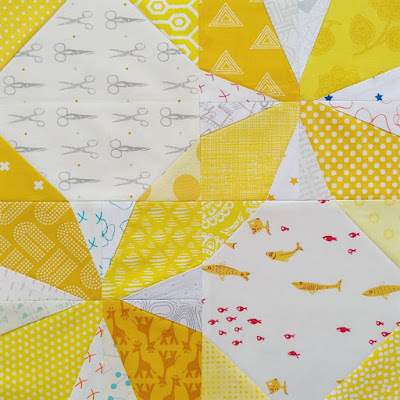 I'm feeling inspired to use up more of my precut stash - especially since my sewing time is a little bit limited at the moment! Sleep deprivation seems to be killing my scrappy mojo at the moment, but sketch challenges are perfect for times like these. I stuck pretty closely to the sketch and kept it clean and simple, which I think worked well for this photo of my two special guys. 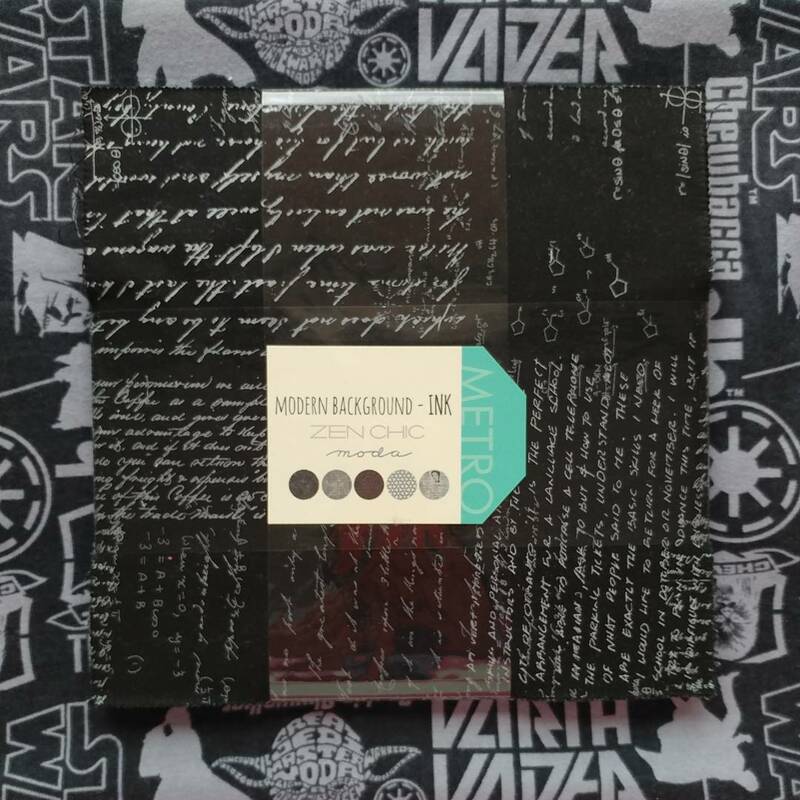 Head over to the SBT50 blog for all the details and to upload your entry. You've got till the end of the month to play along. 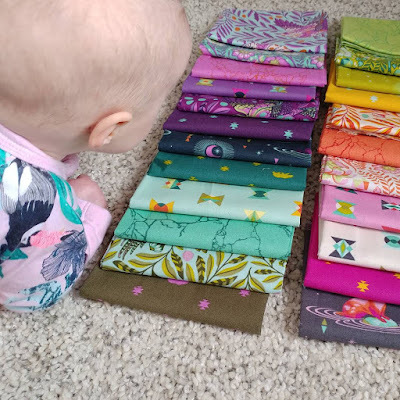 I've been a bit behind on everything lately but am slowly getting caught up, including catching up on sharing my beehive blocks for September and October. 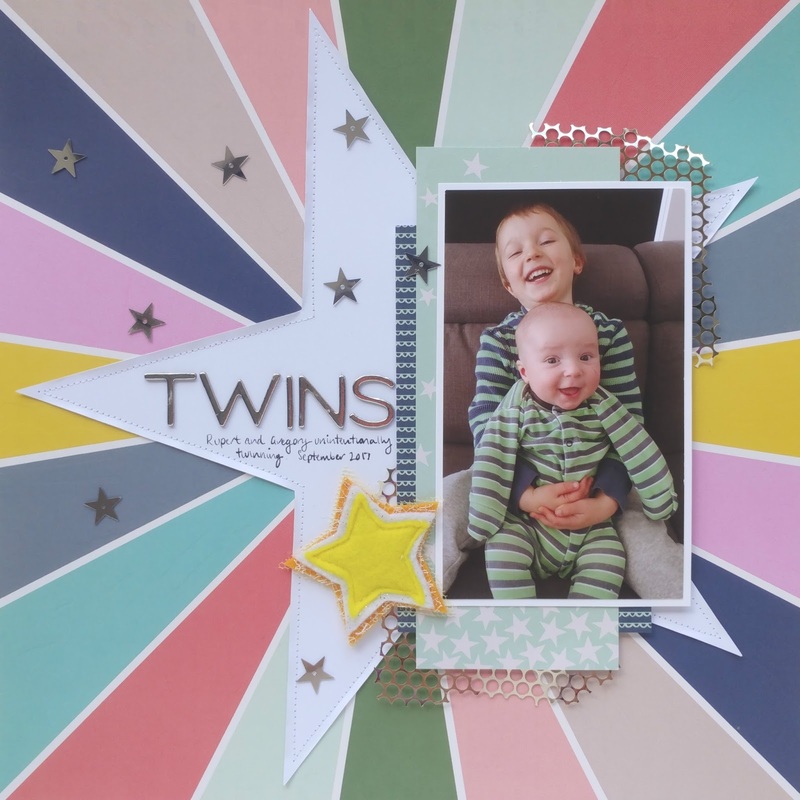 September's queen, Kara, chose the Bunting block with a super saturated rainbow background. I love rainbow blocks so this was a delight to sew. I also didn't need to look much further than by scrap bins, which was a bonus. 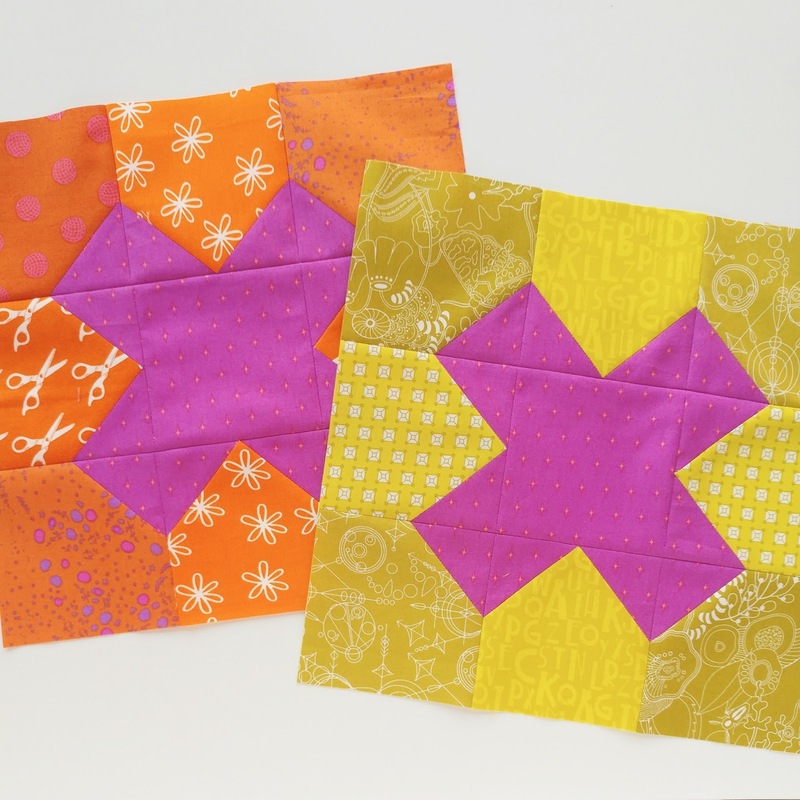 October's queen, Sue, chose the Wanta Fanta block in sunny yellows and low volume. This was a little more challenging for me because Sue encouraged us to include a splash of colour in the background. I hadn't really done low volume with colour before (I usually play it safe with greys and blacks) and blacks, and had to do quite a bit of stash diving to find enough prints, but I quite like the result. 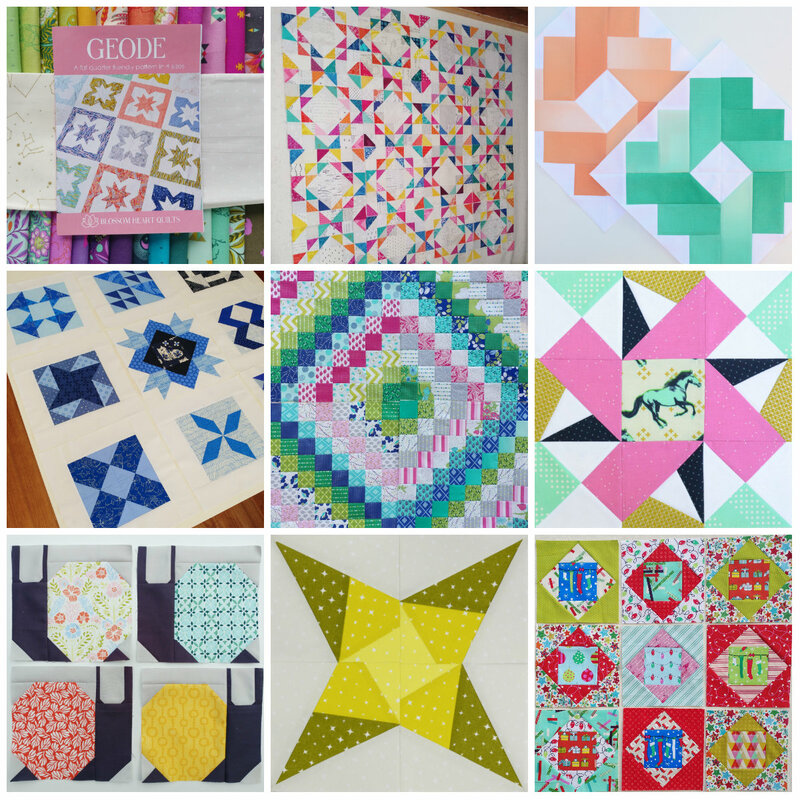 Perhaps one day I'll be brave enough to make a colourful low volume quilt for myself. 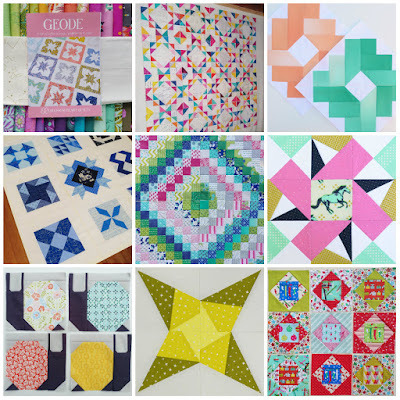 I'm also linking up with Elm Street Quilts One Monthly Goal November Linkup and sharing my goal for November - to have my November blocks done and in the post before the end of the month. Hopefully an achievable goal! Today I'm linking up my list of WIPs that I hope to work on during quarter 4 of the 2017 finish-a-long. Many of these I have shared in detail before (they're rolled over from previous lists) so today I thought I would focus more on sharing some ideas for hiding storing your works in progress. Sorry in advance for the cruddy photos - they were taken late in the day and it was a bit dark). 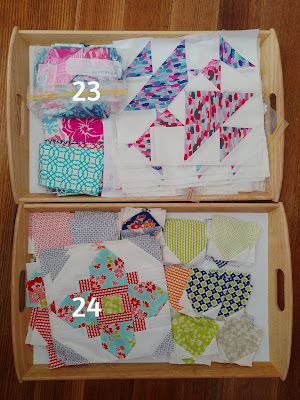 My choice of storage for a WIP is largely determined by the size of the finished block and how much progress I have made. 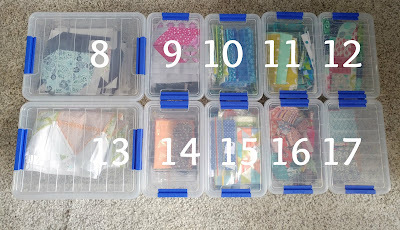 I tend to store piles of blocks ready to be assembled into tops in scrapbook containers stored in a cupboard. These are great because the fit blocks up to 12.5" square and have a decent depth to them. Pastry containers are also good for slightly smaller blocks (but I forgot to take a pic of my stack of those). 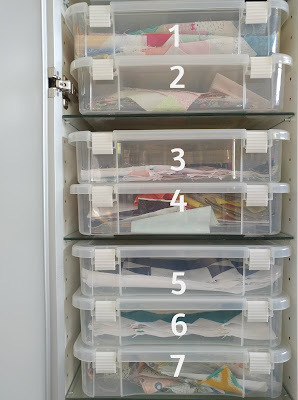 I also have a number of WIPs stashed in clear containers within drawers. I like these particular containers because they have clear lids, which make it easy to see at a glance what is inside. 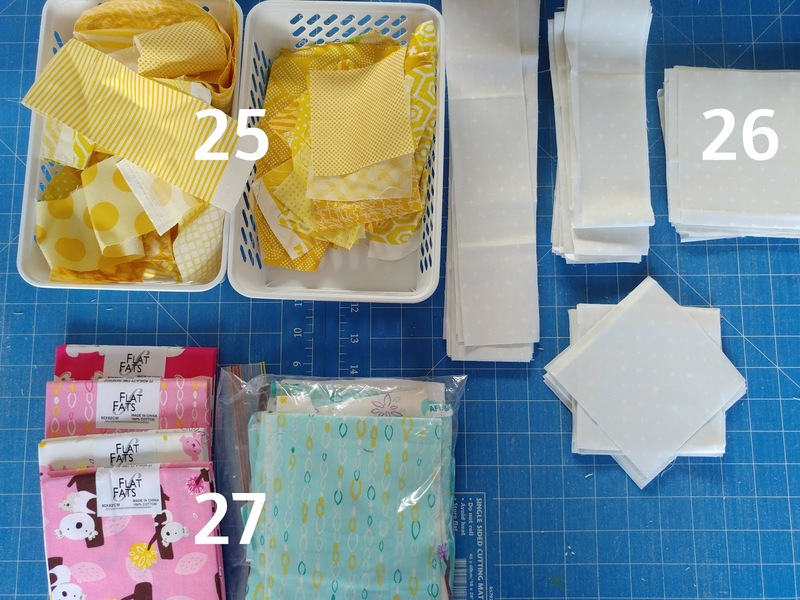 I tend to use the smaller ones for storing projects where I have cut all of the pieces but haven't sewn the blocks. 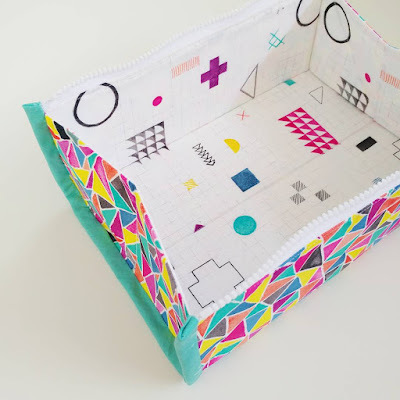 For smaller projects I like to use document wallets - they are cheap, see-through and great for storing printed instructions together with fabric/blocks. Here are a few from my collection. Another place where WIPs tend to accumulate is on the cutting mat. At the moment I have three projects on the go. I find little baskets helpful for storing fabric pieces - it's easy to stack them up and pop them off to the side when I need to cut something else. Finally, I have a lot of WIPs stored in large containers, using a combination of document wallets and baggies. For example, a big tub of Christmas projects I started (but didn't finish) last Christmas. 1. Ripples blocks from this year's bee. 34. 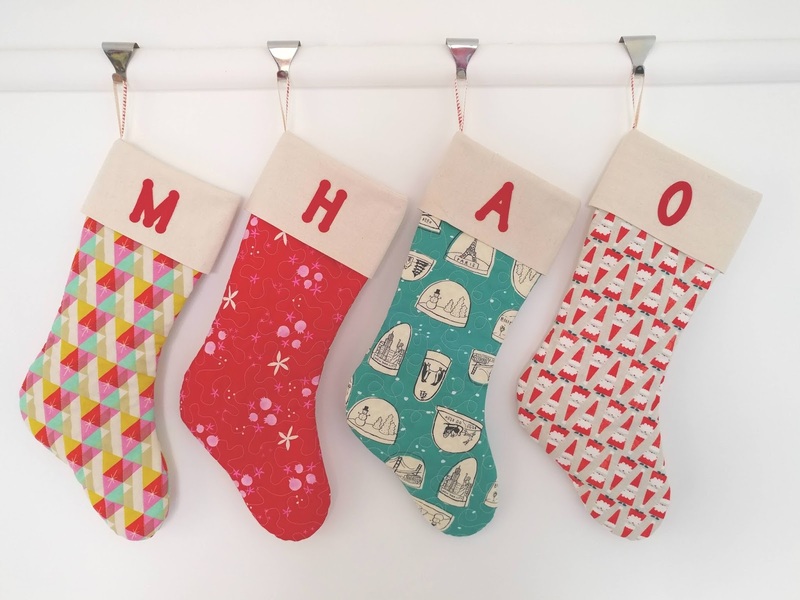 Quilted stockings for my family. 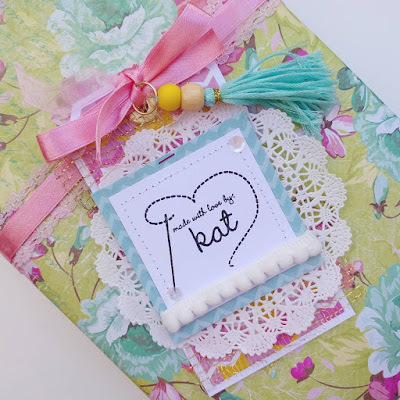 It's been a while since I've linked up with Sunday Stash (hosted by Molli Sparkles) but this week I finally have a few spare minutes to share my latest stash enhancement: a fat quarter bundle of the new Spirit Animal collection by Tula Pink. I wasn't fussed by Tula's last few collections but I LOVE this one. 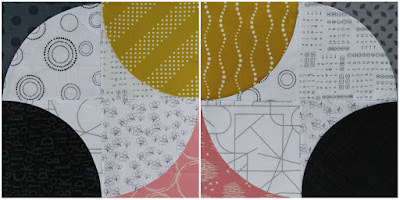 I am especially excited by the return of the arrowhead prints - they were my favourite from in the Acacia collection. Harriet was pretty impressed too. At first I wasn't sure what to make with these (or even to just hoard them forever) but when I saw that Alyce (of Blossom Heart Quilts) was hosting a Geode QAL I knew I had my answer. 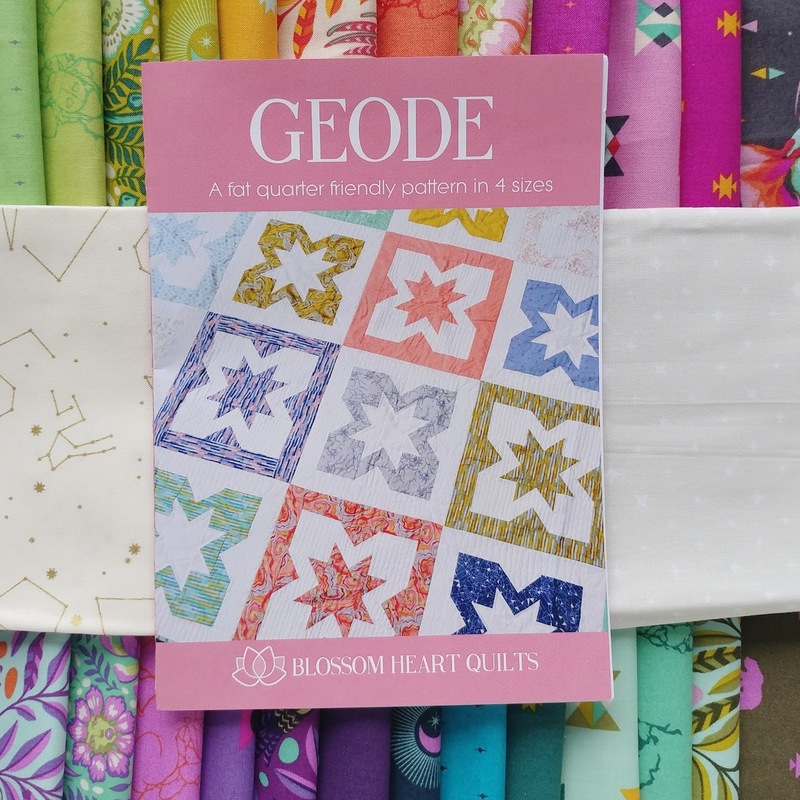 The Geode quilt uses 25 FQs so I swapped out the lightest arrowhead print and added the three diamond prints from Acacia to make it up to 25. 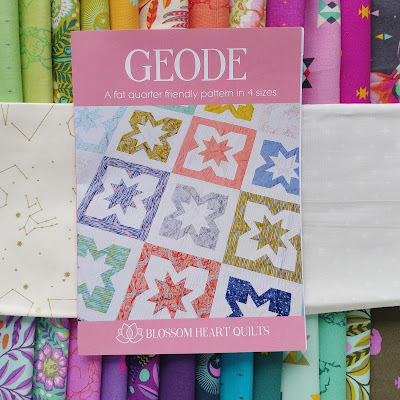 I'm still mulling over background fabric choices - at the moment it is a toss-up between Lizzy House constellations and Cloud 9 stars. 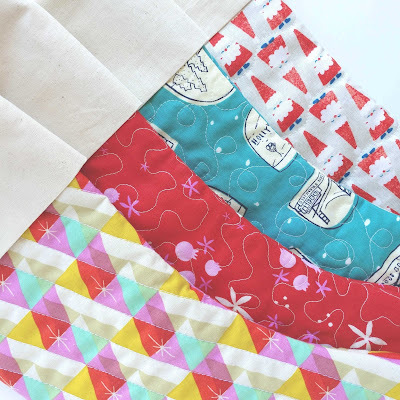 I'm also linking up with Elm Street Quilts One Monthly Goal October Linkup as my goal for this month is to make at least half of the blocks - I'm not sure if I'll be able to keep up with the QAL but I can hopefully make half the blocks (babies and 4 year olds permitting). 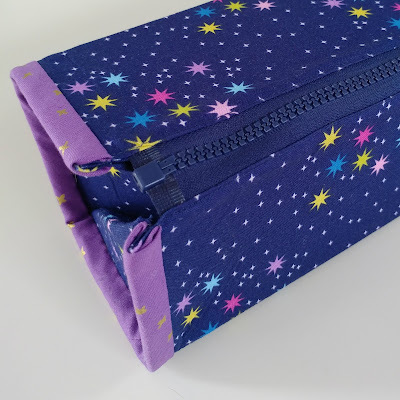 I've got one last finish from my list of proposed Q3 finishes to share - a Zip Up Tray Pouch that I literally finished last night (there's no motivation quite like an impending deadline!). I bought a copy of Aneela Hoey's Zip Up Tray Pouch a while ago after seeing one in use at a sit and sew day. I thought that it would be useful for containing all the hand-sewing supplies that are covering my bedside table. It's far from perfect, but finished is better (and more usable) than perfect and I am happy to have it done. 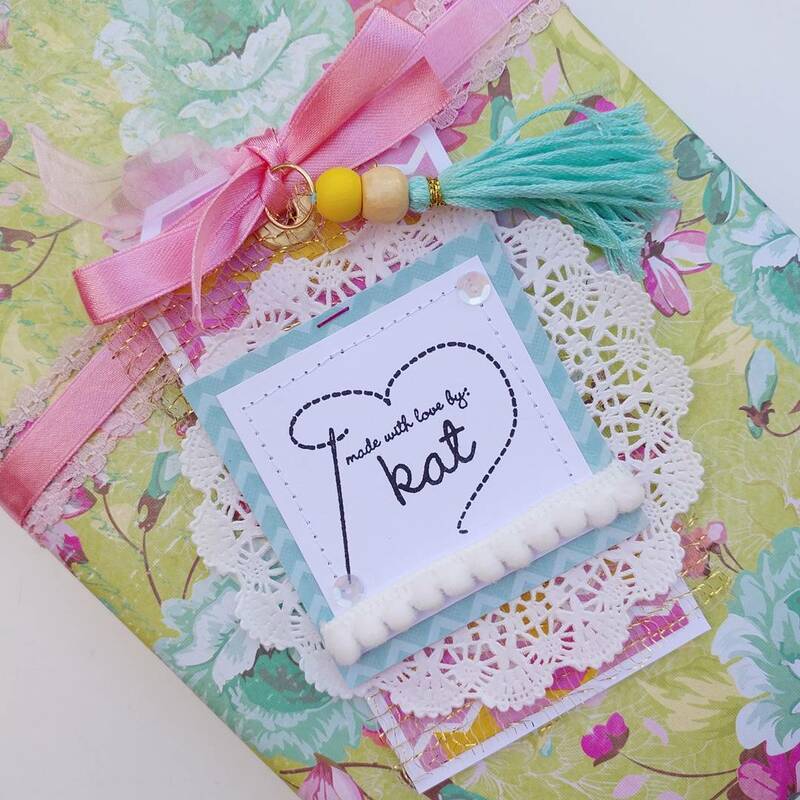 I'ts already been put to use holding my bits and pieces for my in-progress EPP Party blocks. 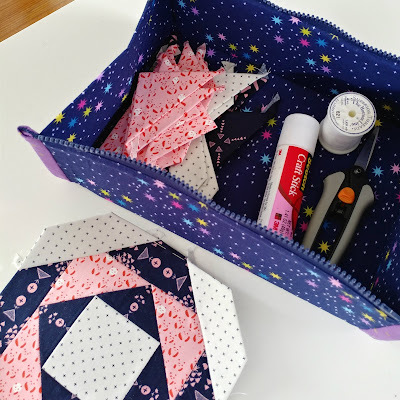 I'm also linking up with Elm Street Quilts 2017 Bag It sew along - I hope that this is the first of many bags I'll sew this quarter. 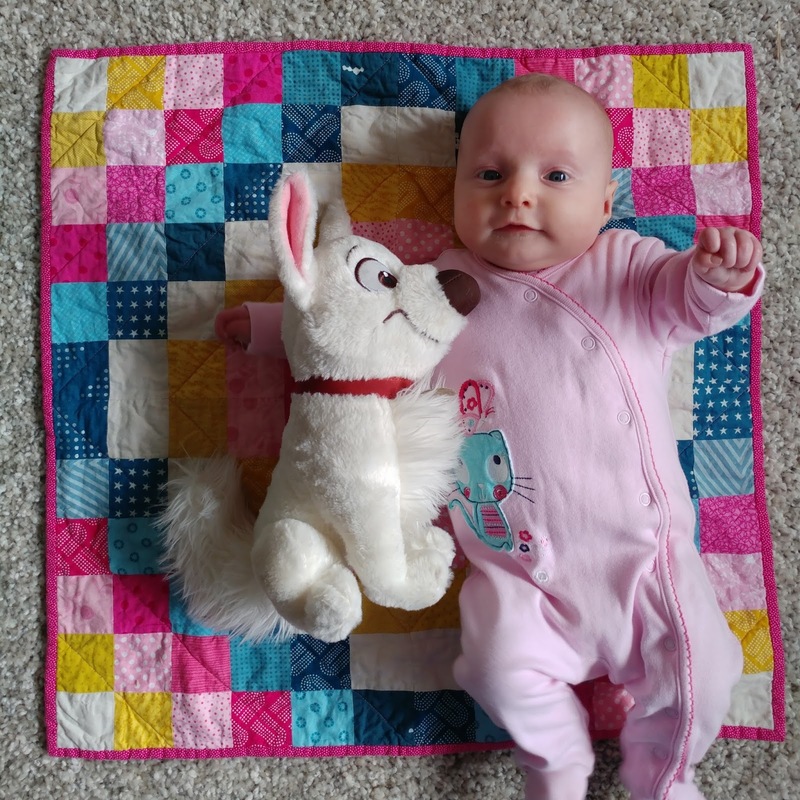 My last quilty finish from my list of proposed finishes for this quarter is a quilt that I made for my friend's daughter, Stella. 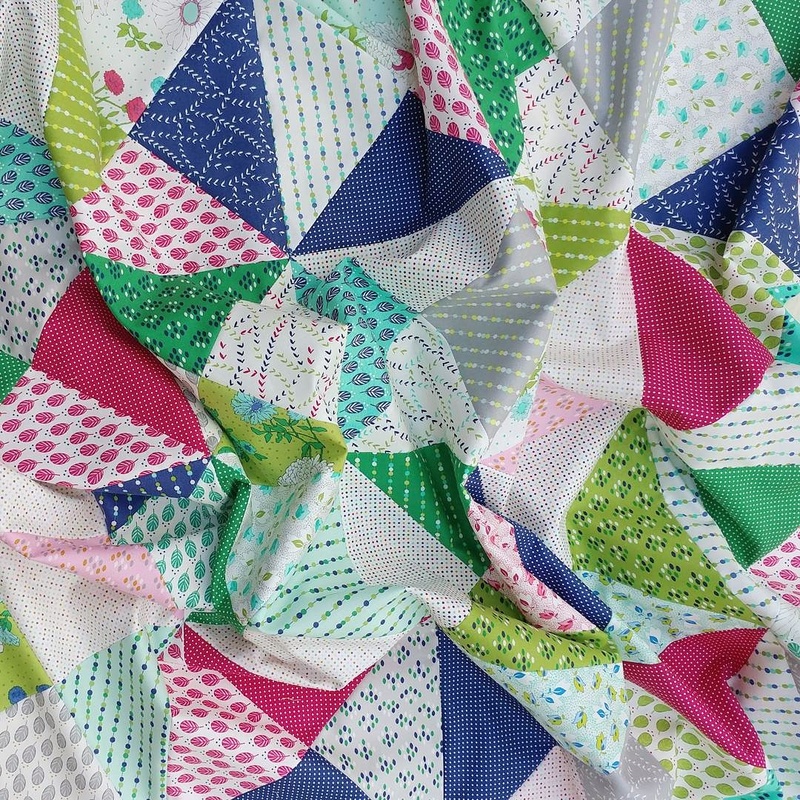 The quilt was made from a set of precut triangles (called Turnovers) from the Color Me Happy range by V & Co for Moda. 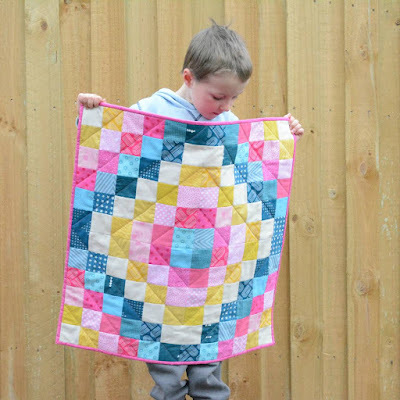 I love the lucious colours in this collection and thought they would make a nice quilt for a little girl. As always, I was short on time so I chose a simple hourglass design. 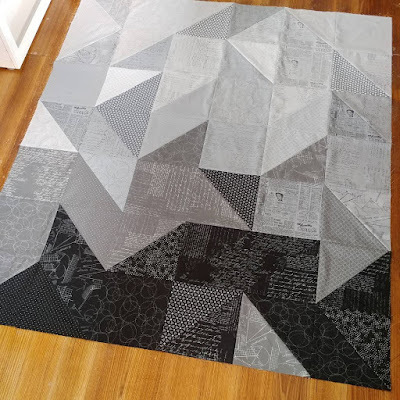 I sewed the Turnover triangles together in pairs (one low volume and one high volume print) to form HSTs and then used the HST to form hourglass blocks. The blocks trimmed down to 9" square unfinished. I used 40 of the triangles in the pack to make 20 hour glass blocks and arranged them in a 4 x 5 layout, alternating the placement of the low-volume prints. This gave me a top that was 34.5" x 43" unfinished so I was able to back it with a single one yard cut from the same collection. I was pretty chuffed at how efficiently I was able use the fabric I had (only 2 triangles unused). For the binding I used a quarter yard cut (cut into four 2.25" strips) so there was also very little wastage there. 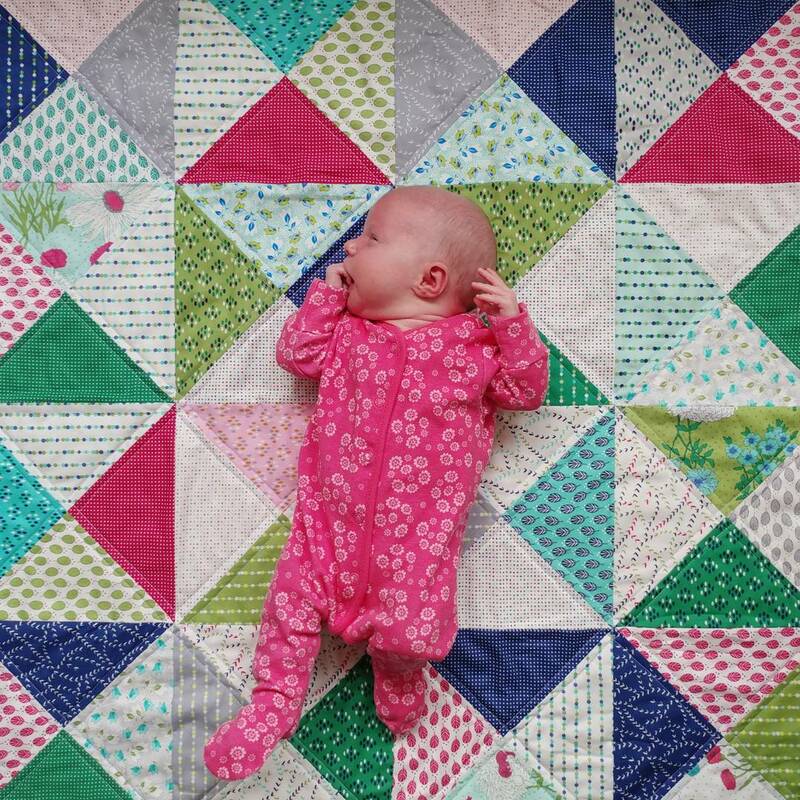 Today I'm sharing a second little bassinet quilt made using spare blocks. I had intended to make a larger scrappy trip around the world quilt in these colours but after four blocks I decided that I wasn't in love with it. 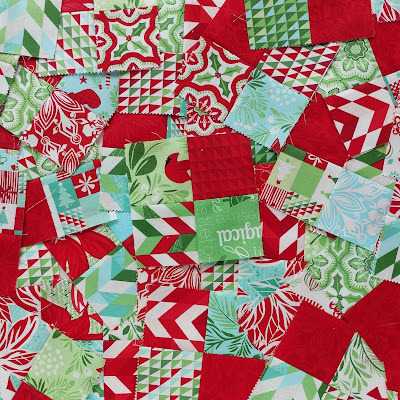 Instead I chose to make a version with 8 prints in each blocks and use up some of my hoarded jelly roll strips. As you can see, she's almost outgrown it. 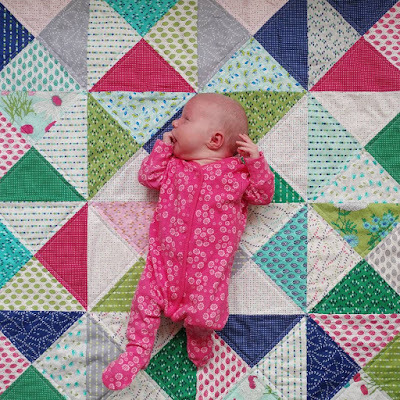 Luckily I have a nice big pile of WIPs and test blocks ready to turn into more baby quilts. Linking up with the 2017 finish-a-long as this was one of my quarter 3 proposed finishes. 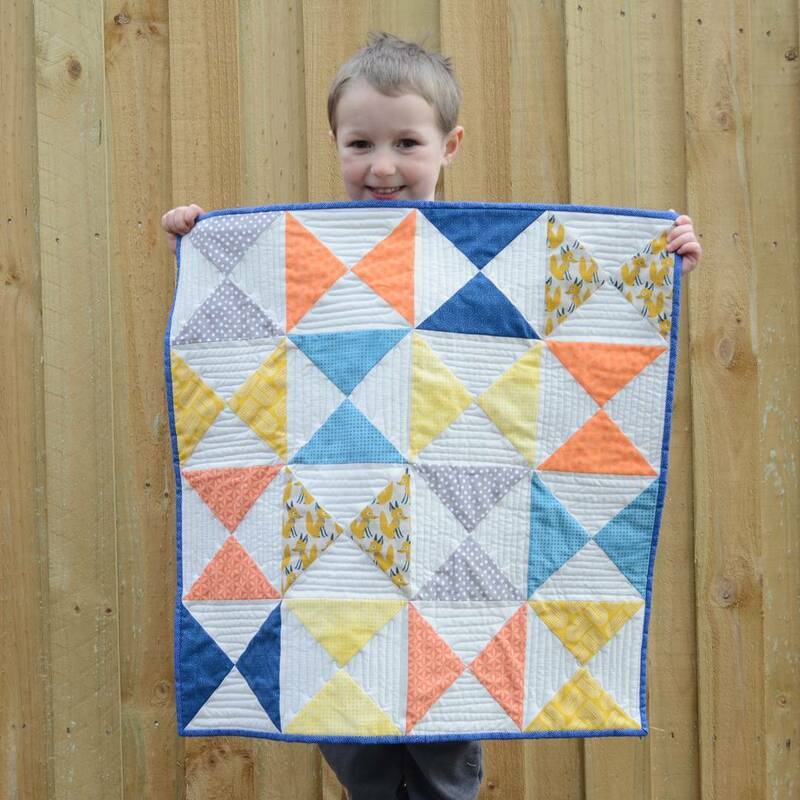 Just a quick post to share a bassinet quilt I made for my little man, Gregory. With two little babies my sewing time is very limited so I've been turning old WIPs and leftover blocks into tiny baby quilts. This one was made using some hourglass blocks I made a few years ago (expert quilt holding by big brother Rupert). I kept the quilting simple with a back and fourth line in the background squares only. Although it feels like I only just finished it, he's already outgrowing it. Linking up with the 2017 finish-a-long as this was one of the projects I aimed to finish this quarter. I'm linking up again with the 2017 finish a-long and sharing some swap extras that were on my quarter 3 list of proposed finishes. When making mini quilts for swaps I often start with the extras (little gifts that are included with the mini quilt) because they are often fun to make and there is less pressure than when making the actual mini quilt. 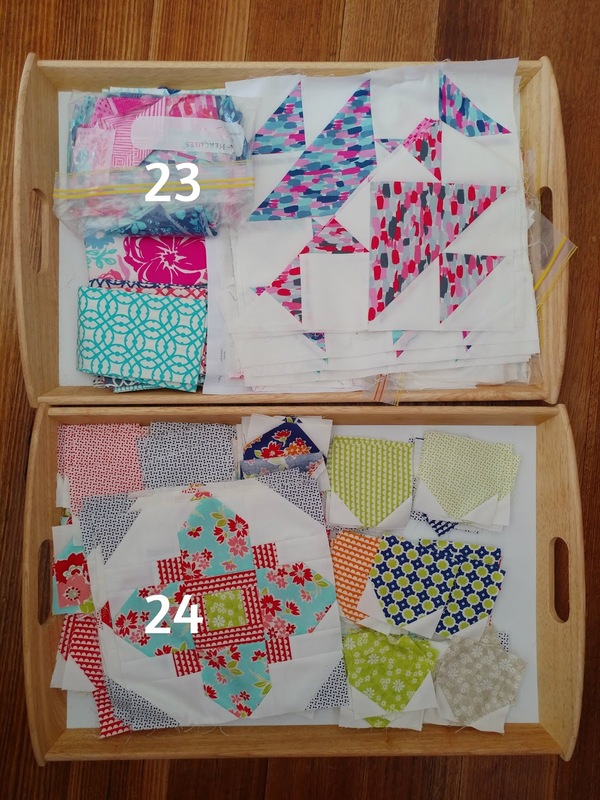 For the Aussie Mini Barn Quilt Swap my partner made it really easy for me to decide what to make her. 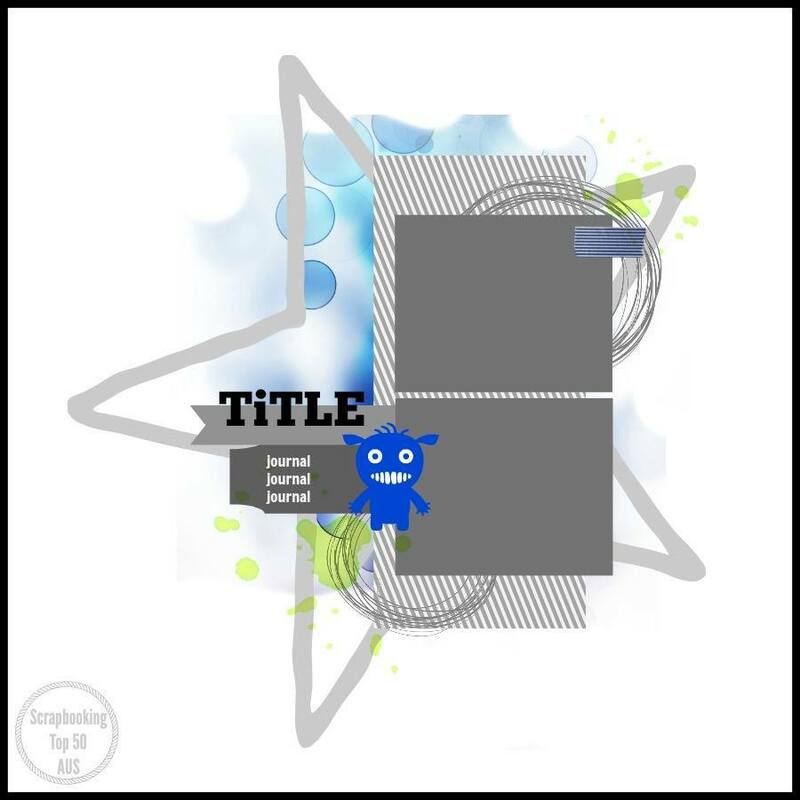 In her submission she indicated that she loves caramello koalas and collecting mug rugs to brighten up her desk at work. Naturally, I made her a set of mug rugs with little pockets to hold the caramello koalas. Another handmade item I included was a swoon block pin, made using a Dandelyne mini hoop and some cross-stitch supplies. 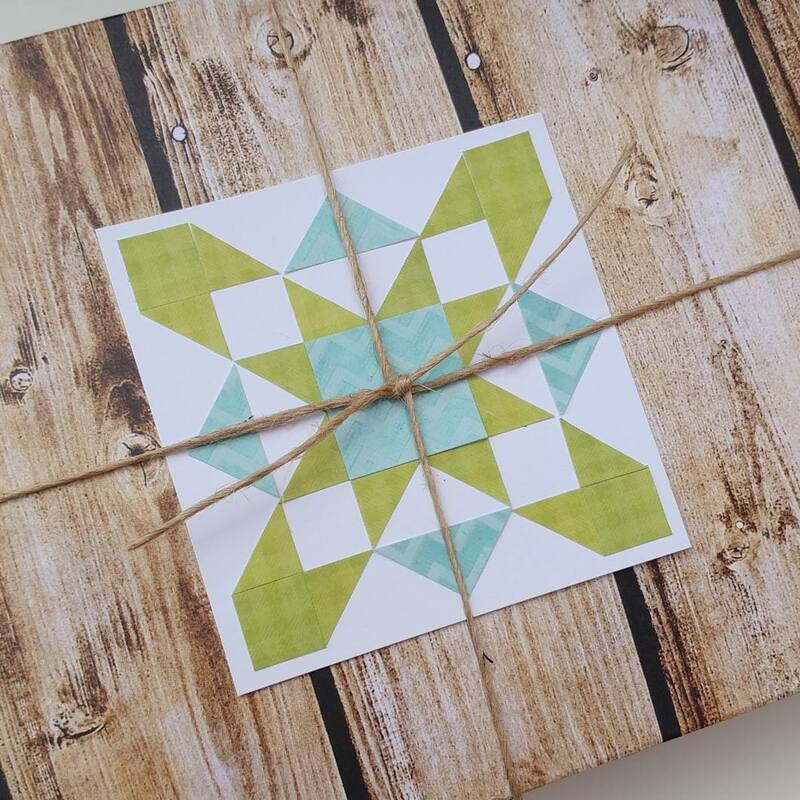 One of the swap requirements was to "prettily package your parcel" so I went a bit OTT with the wrapping, making a handmade box for the mug rugs (I used some woodgrain paper in line with the barn quilt theme) and added a pretty handmade tag.